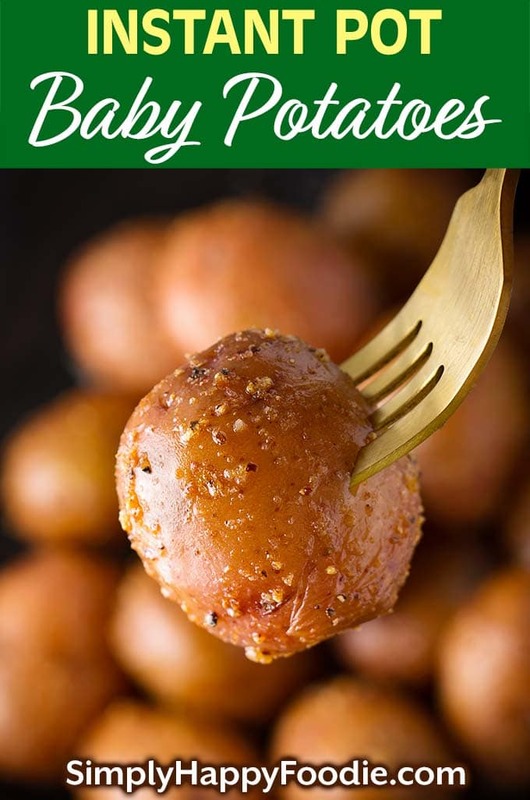 Instant Pot Baby Potatoes are tender, tasty and easy to make. This is a nice Instant Pot side dish to go alongside chicken, pork, or beef. 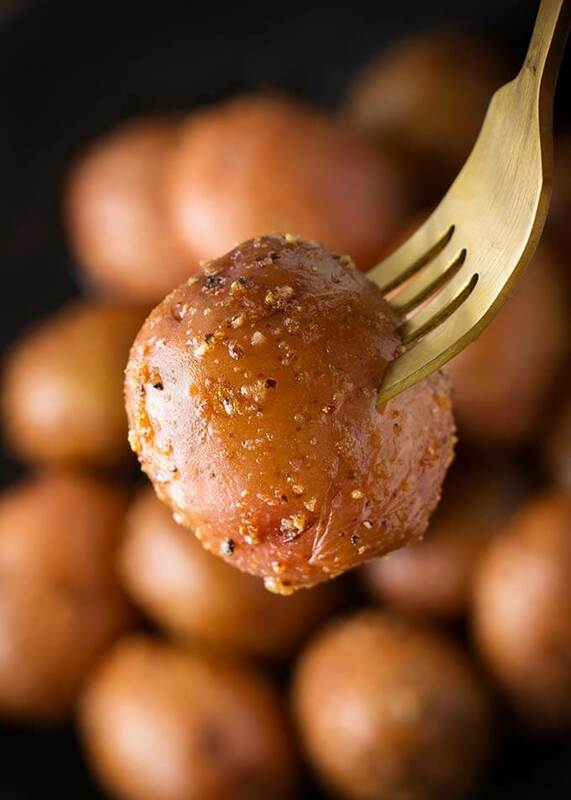 You can make these pressure cooker baby potatoes with red or gold baby potatoes. Potatoes are very versatile, and there are so many varieties available! 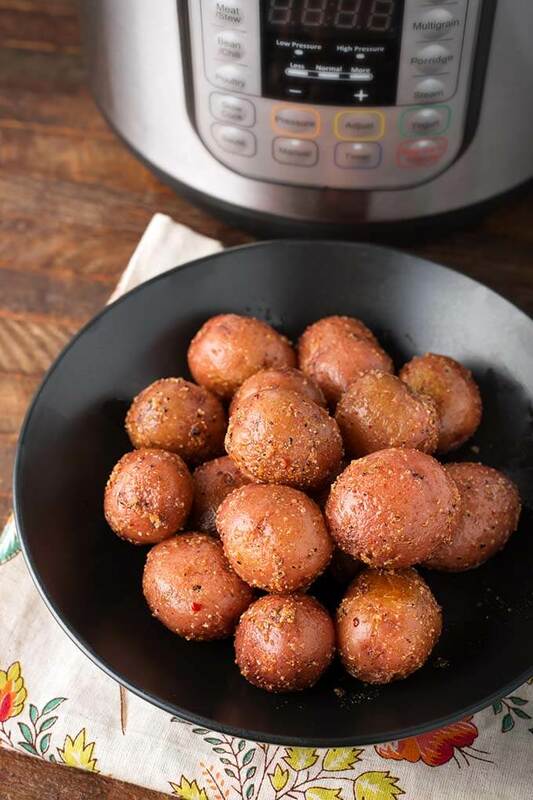 I love the baby potatoes, and it’s a breeze to cook them in the Instant Pot®! Baby potatoes are just that. Babies. Also called new potatoes, they are potatoes that are harvested [from the ground] before they are fully grown/developed. They come in red, gold, and purple. Baby potatoes have a sweeter flavor and a nice thin skin. Because they are so small, measuring about 1 1/2″-2″, they are best cooked whole. These little potatoes are best when steamed, boiled, or roasted, as they have less starch than russets (which are fluffy when baked). They come out with a creamier texture that is wonderful! After pressure cooking them, you will sauté the cooked potatoes in some butter and seasonings. The potatoes will usually crisp up just a little on the outsides, leaving the insides soft and creamy! The seasoning I used for this recipe is just about 1/2 of a packet of zesty Italian salad dressing mix. You can use a little more for a stronger flavor. You could also use ranch dressing mix, or some Italian seasoning, garlic powder, onion powder, salt & pepper. Go ahead and get creative with the spices and use what you like. 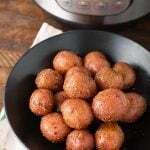 Make Instant Pot Baby Potatoes vegan by swapping the butter for olive oil. Instant Pot Baby Potatoes are tender, tasty and easy to make. 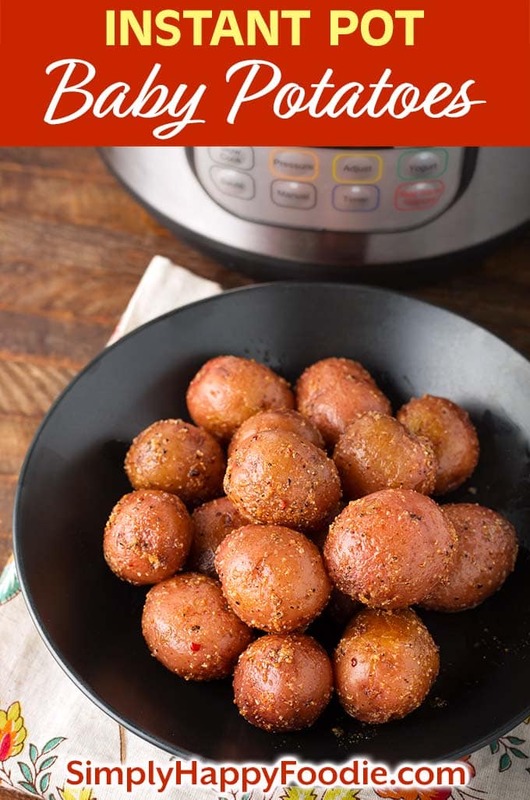 You can make these pressure cooker baby potatoes with red or gold baby potatoes. Add the water to the inner liner pot of the pressure cooker. Set a steamer basket in the pot. Gently scrub and rinse potatoes. Place them in the steamer basket. Press the Pressure Cook/Manual button or dial, then the +/- button or dial to select 12 minutes. High pressure. The pot will take a few minutes to come to pressure. When the cook time is finished, turn the steam release knob to the Venting position to do a Quick Release of the pressure/steam. When the pin in the lid drops down, open and carefully remove the steamer basket of potatoes. Empty the inner pot and dry it. Then put it back in the main housing and turn on the Sauté setting. When hot, add the olive oil and butter, then add the cooked potatoes. Let them sit a minute before stirring. Try to get them a little browned on all sides. Sprinkle the Italian dressing mix and garlic powder over the potatoes. Gently stir to coat all of the potatoes. Cook just a few seconds more to let the seasoning bloom. Turn off the Sauté setting and remove potatoes to a serving bowl. Drizzle with any butter/oil left in the pot. I loved these potatoes! I added a little extra garlic powder and cayenne for some hest. We ate all of them!